FIG celebrated this transition on 9 November 2018 in Athens, Greece at a joint celebration of FIG 140 anniversary and hand over ceremony. President Staiger will present the council work plan at the General Assembly 2019 in Hanoi, Vietnam. 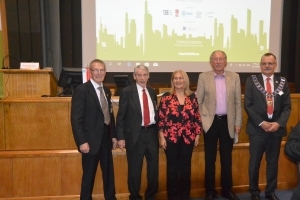 The picture shows President Rudolf Saiger together with four Honorary Presidents, from left Juha Talvitie, Finland, Bob Foster, USA, Chryssy Potsiou, Greece and Holger Magel, Germany. Current position: Professor at the University of Applied Sciences Bochum, Dept. of Surveying Engineering and Geoinformatics. Prof. Dr.-Ing. 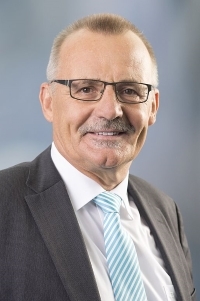 Rudolf STAIGER is teaching Surveying Engineering at the University of Applied Sciences in Bochum (Germany). His areas of special interest are instrumentation and calibration of geodetic sensors, Laser scanning and data analysis. He studied Geodesy in Karlsruhe (Germany, University of Karlsruhe) and in Paris (France, ENSG). The subject of his doctoral thesis is “close range triangulation with theodolites for coordinate measuring purposes”. Rudolf spent 6 years in industry with KERN and Leica-Geosystems (both in Switzerland) as Systems Engineer, Product Manager and Software Developer. From 1994 to 2005 he was teaching Surveying Engineering at the University of Essen (Germany). Since then he teaches in Bochum where he also served as Vice-President of the University for Research & Transfer (2009-2016). Rudolf is very active in FIG. 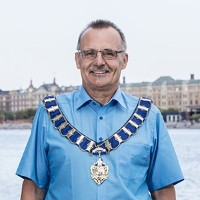 He was the Chair of Commission 5 (Positioning and Measurement) and is currently acting as Vice-President. His language abilities are German, French and English.